Betsy Martin has worked as secretary at New River Health’s Summersville School- Based Health Center for 17 years. She loves getting to work with the students who visit from SMS and NCHS. Her favorite activities to do after work are crocheting, reading, and watching NCHS sports. 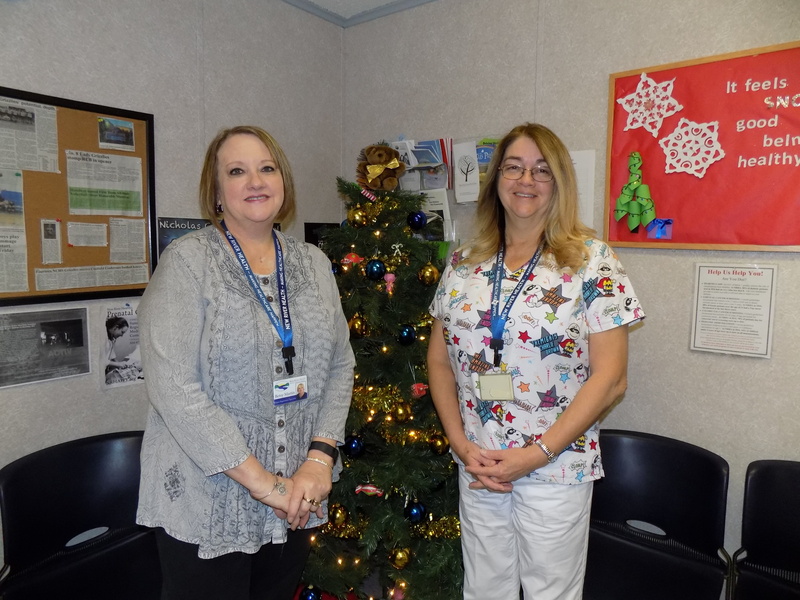 Nurse Terry Vogel has been at the Summersville Based Health Center since 2009, and she loves the students who seek care at the center. Terry loves spending time with her family, and she also enjoys hunting, fishing, and doing art after work. Terra Bushman is the dental hygienist. She provides everything but x-rays including dental health care, and health education. Flu shots are given at the center to any child as long as he or she has parental permission. Allergy shots can be given with a doctor’s order. Summersville School Based Health Center is open Monday through Friday from 7:30 a.m. to 3:30 p.m. The staff goes out to lunch from 11:30 – 12:00.